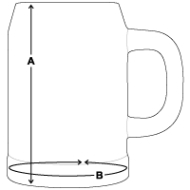 Beer Mug is in stock. We will print it as soon as you order it. Cheers and bottoms up! This classic beer mug lets you enjoy a pint of good stuff even more: take some Oktoberfest atmosphere home, and enjoy your lagers and ales!